When you are in the Santa Fe-Taos-Northern New Mexico region, there are a myriad of interesting things to do and see competing for your time and attention. 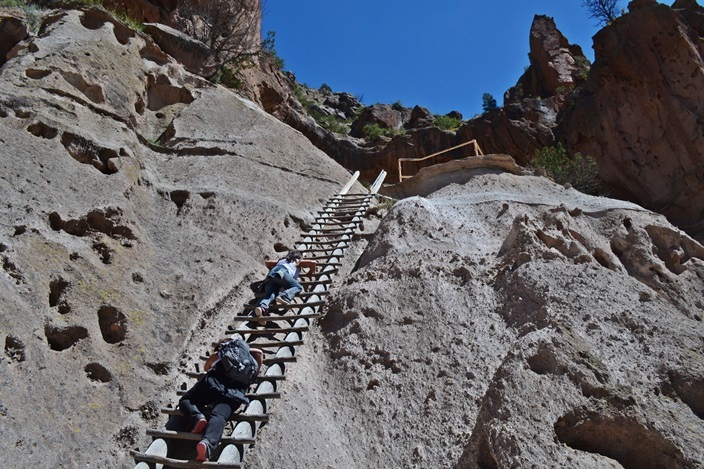 One you may never have heard of but which I would highly recommend is Bandelier National Monument. 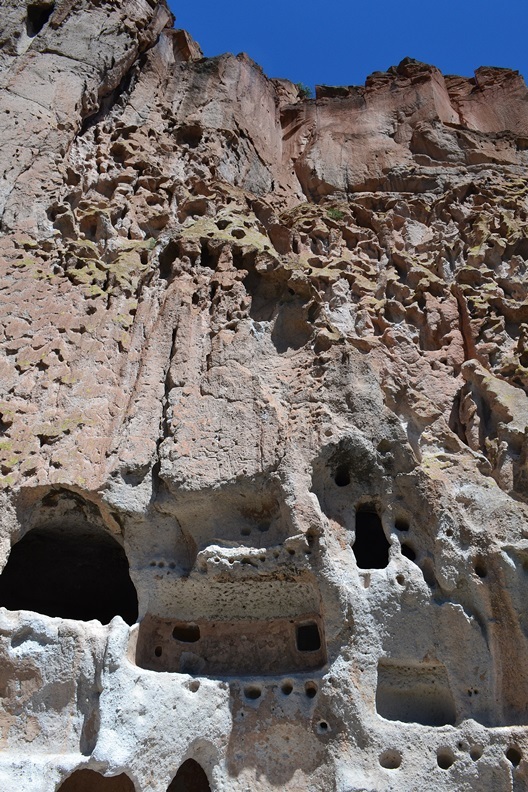 Located about 30 miles west of Santa Fe, Bandelier is one of the premiere ancient Native American dwelling sites in the southwestern U.S.A. Ancestral Pueblo Indians inhabited the area from approximately 1150 to 1550. After this date the evidence indicates they moved on closer to the Rio Grande. 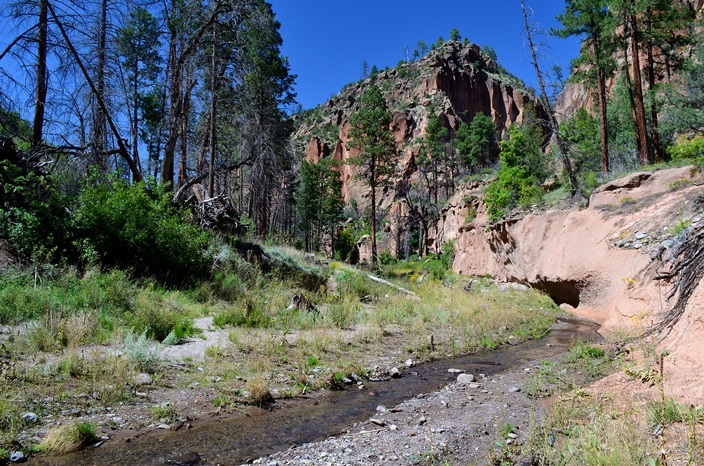 The Monument covers 50 square miles of the Pajarito Plateau in the Jemez Mountains. 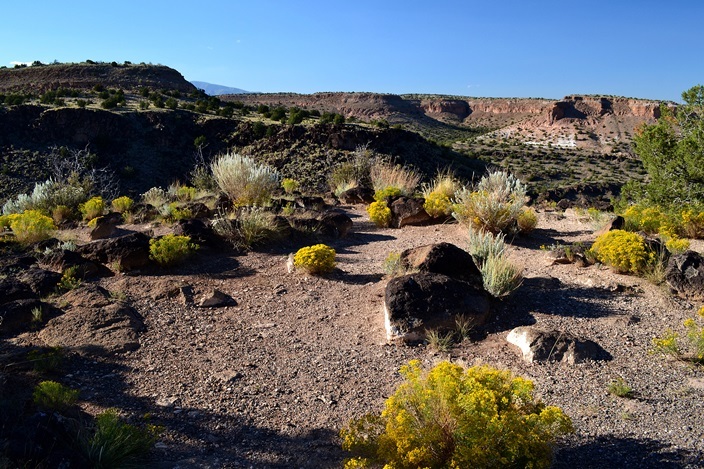 Over 70% of the Monument is wilderness, with more than 70 miles of hiking trails and a one mile-plus elevation change from highest to lowest point. 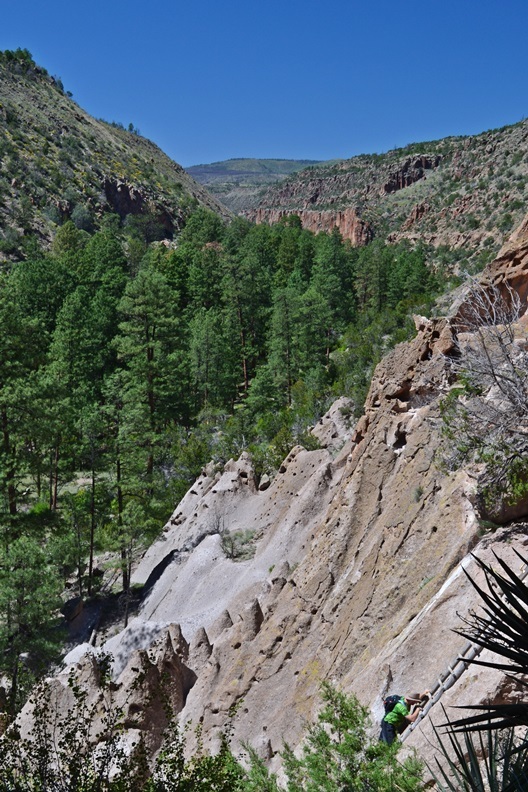 The Bandelier Visitor Center and heart of the Monument is located in Frijoles Canyon, not too far from the town of Los Alamos. Yes, that Los Alamos, birthplace of the atomic bomb. But long, long before scientists converged in New Mexico to split the atom, there were Native Americans living and dying in this very same region for centuries. 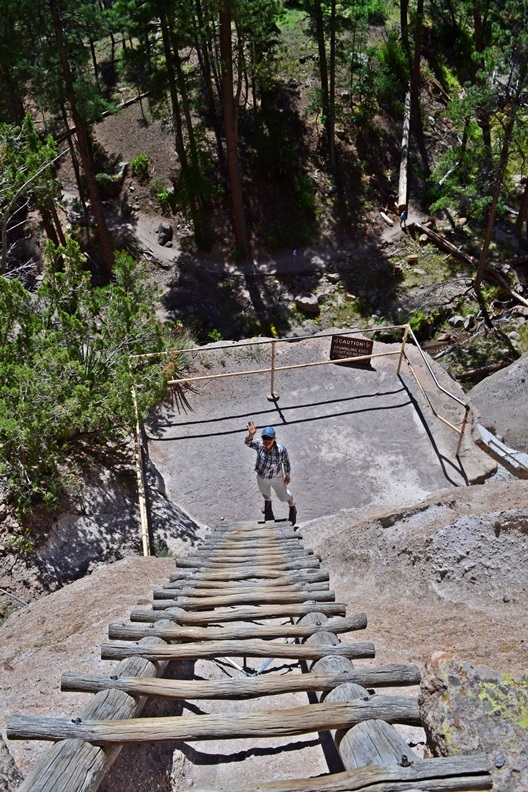 Bandelier protects those Ancestral Pueblo archeological sites, along with a diverse and scenic landscape, and the country’s largest National Park Service Civilian Conservation Corps National Landmark District. 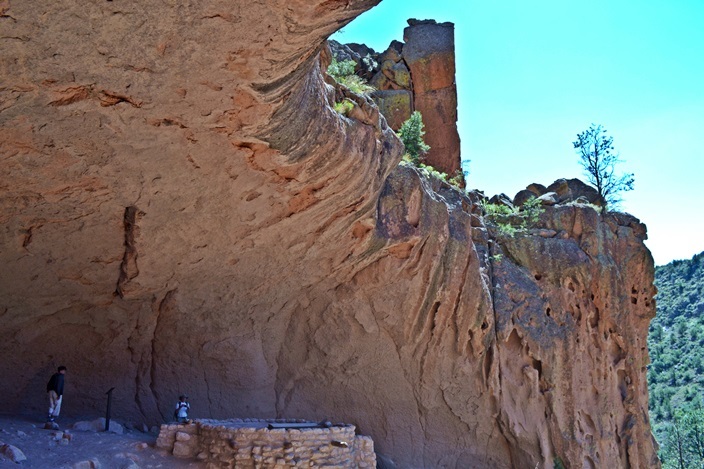 Frijoles Canyon contains a number of ancestral pueblo homes, kivas (ceremonial structures), rock paintings, and petroglyphs. 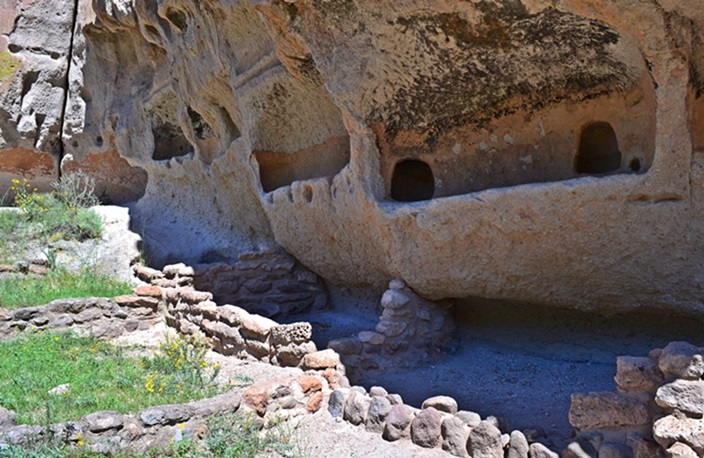 Some of the dwellings were rock structures up to three stories high, built on the canyon floor. 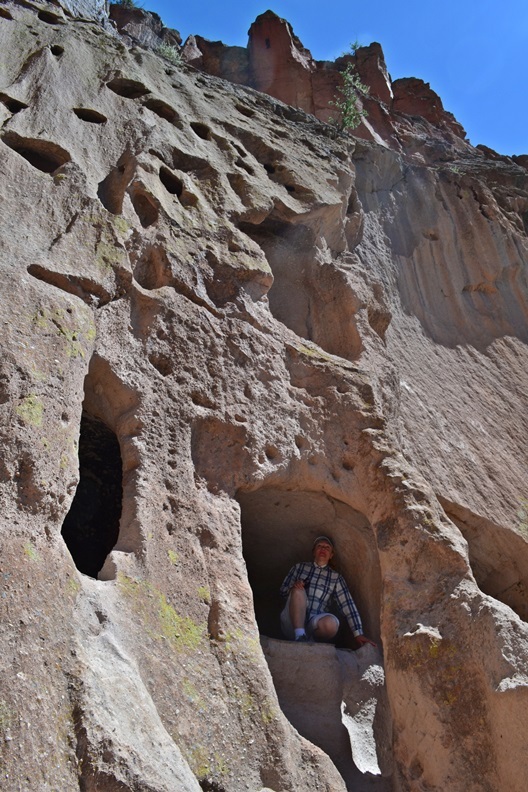 Some others were small caves produced by voids in the volcanic tuff of the canyon wall and carved out further by humans. 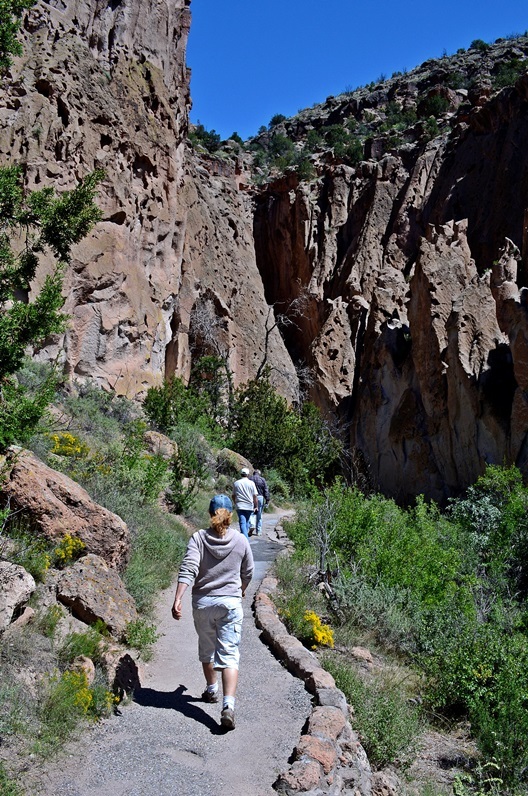 A 1.2-mile predominantly paved, “Main Loop Trail” affords access to these features leaving from the visitor center. The first features of note you come across on the Loop Trail are the stubbly rock remains of the walls of former Pueblo dwellings. Moving on to higher ground, the hollowed-out cliff caves are fun to poke your head into, with small ladders to facilitate your viewing of them. This portion of the loop also gives you a nice aerial view of the ruins below and a better perspective of their circular, compact layout than you can glean from ground level. 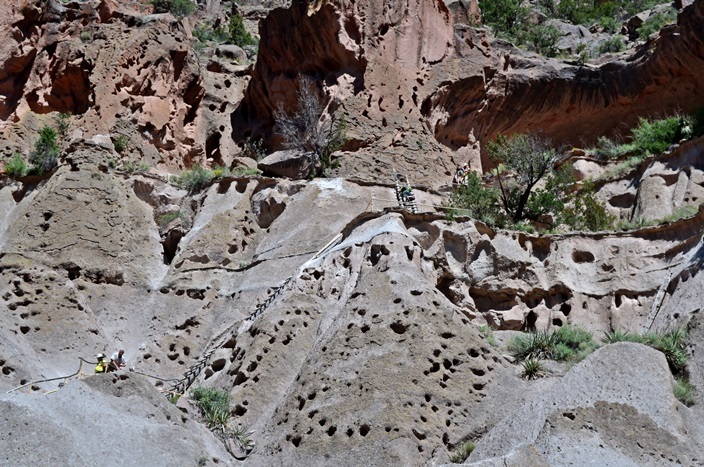 The caves in the canyon walls continue on for a good half mile with some variation in size and shape, along with petroglyphs etched into the walls. A trail extending another half mile beyond this loop leads to Alcove House (formerly known as Ceremonial Cave) a shelter cave produced by erosion of the soft rock. The trail is level and easy enough to traverse. Alcove House itself, however, can only be accessed via a series of four ladders gaining 140 vertical feet, which can prove more than a little intimidating to those with vertigo or a fear of heights. 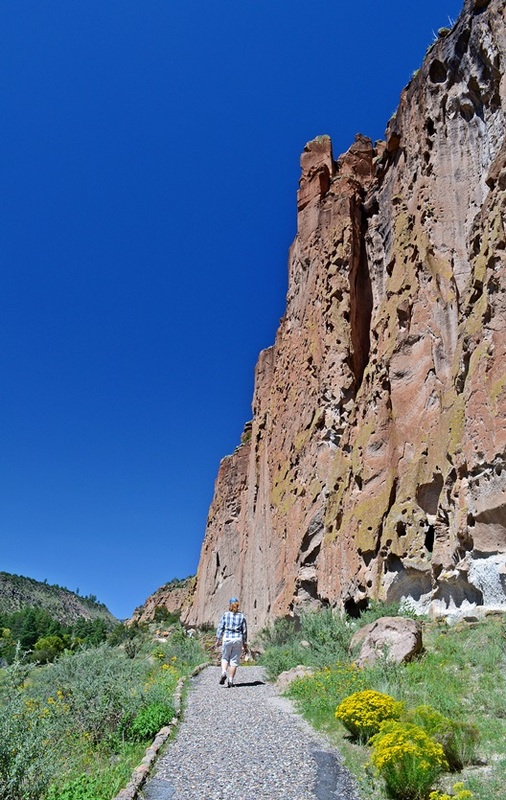 For me, it was the highlight of my entire visit to Bandelier. Climbing the ladders was great in a little-bit-scary-funhouse sort of way. You don’t want to look down a whole lot while making the ascent – or the descent, for that matter – but nothing too intimidating for a longtime tree climber like myself. Can’t say the same for some of the folks around us who were making the trek at the same time we were. 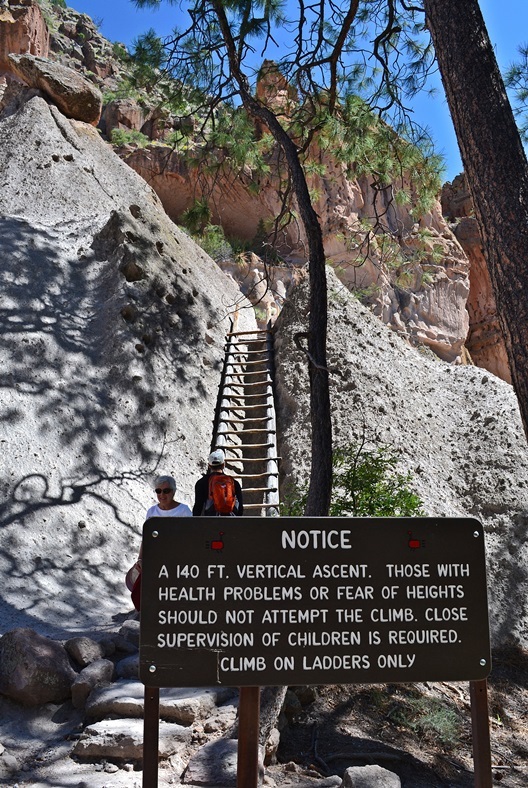 At one point on the way up we had to wait several minutes for one woman to descend a section of ladder, shaking and white-knuckle-gripping her way down one painfully slow step at a time while her companion coaxed and coached her from one rung to the next. I was ready to go up and throw her on my back and clamber down with her myself. If you’re that deathly frightened of heights, why go up in the first place? 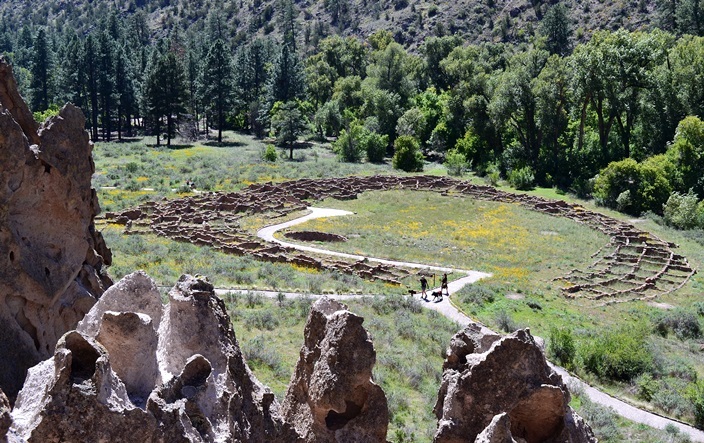 During its period of habitation, the Alcove House pueblo was home to around 25 Ancestral Pueblo people and features a reconstructed kiva that offers views of viga holes and niches of several homes. 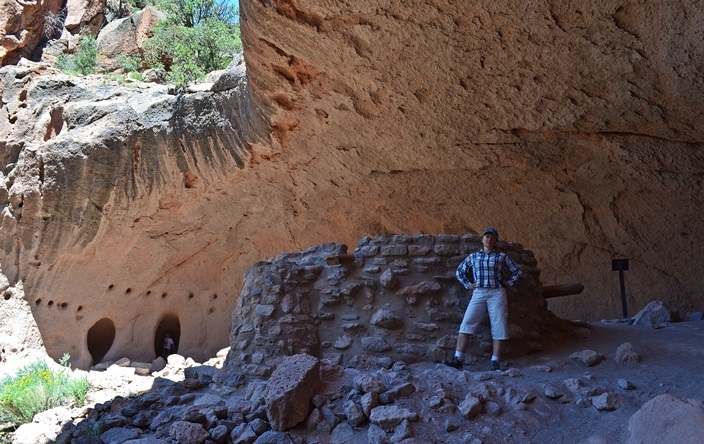 Unfortunately, as of spring 2013, access to the kiva’s interior is closed indefinitely for safety reasons associated with stabilization of the structure. We spent about twenty minutes at the top, enjoying the view of the canyon spreading out to the north. If there would be any modern equivalent, living up here would have been the Pueblo penthouse condos. Of course, the express elevator to the top leaves a little to be desired. After descending, we decided to explore the canyon northward along the creek, away from the main visitor center area and were glad we did. The weather was perfect, sunny but not too hot with lots of shade, and the gurgling creek beside us made for a lovely hike. The area is prone to flash floods (they have lots of signs posted warning visitors of this) and we encountered a series of enormous downed timber debris fields as evidence. We took our time strolling back to the visitor center, then waited around for the next shuttle bus to take us back to the main parking area in the town of White Rock. 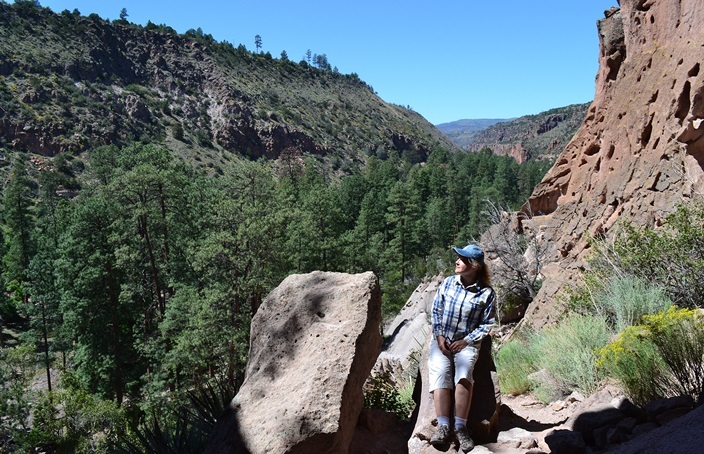 Due to parking constraints in Frijoles Canyon during peak tourist season, individual passenger cars are not allowed to drive into the canyon. Not to worry, though, as the shuttle bus system runs regularly and keeps the narrow canyon road free of what would otherwise be clogged, exhaust spewing traffic. 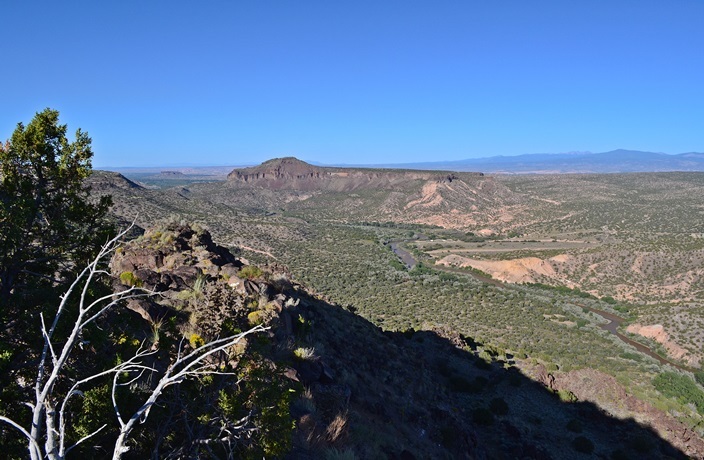 Speaking of White Rock, if you’re already in the area to see Bandelier, you might as well go and see the overlook of the Rio Grande from the edge of town. 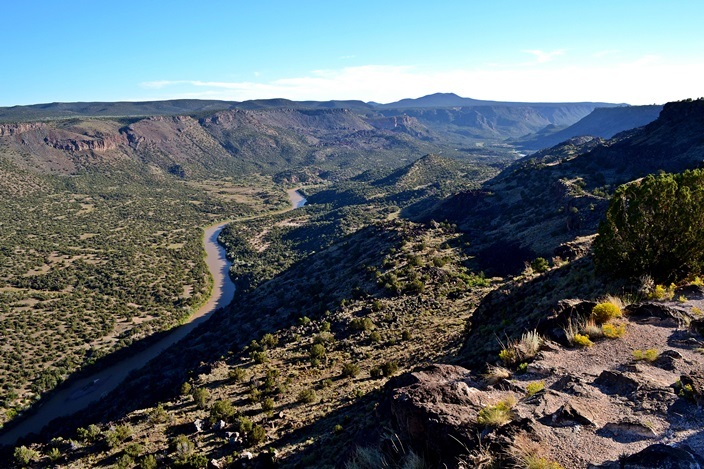 Probably like most Americans, when I think of or hear the words “Rio Grande” I immediately picture the Texas-Mexico border and not much else. Certainly not northern New Mexico. But a quick glance at any U.S. map will show you that just west of El Paso, the Rio Grande takes a sharp northward turn into New Mexico. Okay, that’s actually not true, since the river’s source is in the Rockies and it’s flowing south through New Mexico towards Texas and eventually the Gulf of Mexico. Anyway, the point is that the town of White Rock has a great vantage point where you can view the river some hundreds of feet below. We stopped by a liitle before sunset, saw some kayakers running the rapids, and enjoyed watching the lowering sun spill it’s golden light across the hills and into the gorge, a perfect end to our day at Bandelier National Monument.